Elliot vase - 5¼" (133 mm) high. Quite possibly Ewenny, but Elliot's is the only mark. Horace Elliot was a designer and dealer active at the end of the nineteenth century. As a keen member of the arts and crafts movement, he visited country potteries to acquire pots for his Bayswater showroom and to show at the various arts and crafts exhibitions in which he was involved. He was particularly associated with Ewenny. He made annual visits there until 1913, often staying for a long time, and he designed many pieces for the Jenkins brothers to make. His fleur-de-lys mark was often applied to Ewenny and other wares. Elliot's interest was not confined to Ewenny; he was associated with C H Brannam, Bourne Denby and other potteries of the day. 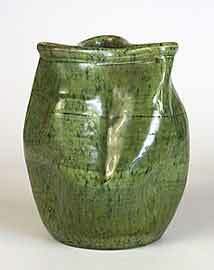 He was a protagonist in the Esperanto movement, and sometimes inscribed his pots in that language.